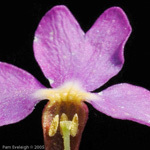 Primula halleri J. Gmelin, Onomat. Bot. Compl. 7:406. 1775. Type specimen: Unknown but according to Fenderson, it is as Haller, Hist. Stirp. Helv. 1: no. 611., pg 272. 1768. P. longiflora (syn): All., Fl. Pedem. 1:92. 1785. drawing t. 39, fig. 3. Aleuritia longiflora: Opiz in Berchtold & Opiz, Okon. Techn. Fl. Boehm. 2:196. 1838-9. Epithet: Named for Albrecht von Haller. Distribution: Several disjunct locations in the Alps, Carpathians, Balkans , Armenia, Caucasus. A European species, often encountered in the Alps but widely disjunct through to the Caucasus. Similar to P. farinosa but easily identified by the very long, red floral tube. Usually homostylous (see additional reference) and generally self-fertile, sets abundant seed and is easily grown in the garden. See P. yuparensis, a Japanese species, which has a similar long corolla tube and often plants labelled P. yuparensis are actually P. halleri.